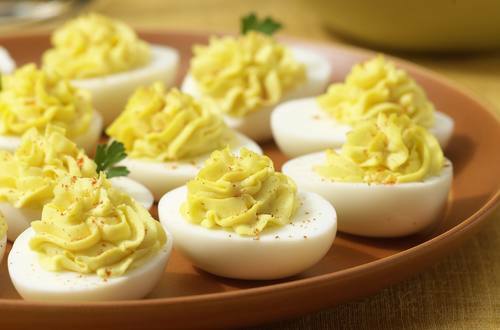 Try our classic deviled eggs with relish recipe for your next party. Your guests will never leave after trying these tasty deviled eggs with relish! Yum! 3 Spoon or pipe yolk filling into egg whites. Chill, if desired. Garnish, if desired, with parsley and sprinkle with paprika. TIP: For a different taste...add 1 tablespoon pickle relish or finely chopped sweet pickles; OR 2 tablespoons cooked crumbled bacon; OR 1 tablespoon chopped green onion, 3/4 teaspoon chili powder and hot pepper sauce to taste.